The Sisters’ story began in the 1840s when Eulalie Durocher (1811-1849) and Mélodie Dufresne (1809-1881) earned a reputation for creating a hospitable, smoothly run home for Eulalie’s brother, Theophile, a parish priest in the rural Richelieu Valley of Quebec. Although Eulalie herself had little formal education, in her pastoral work she saw the great need for instruction of youth, especially girls. She hoped to enter a religious order but poor health stopped several attempts. Nevertheless, her piety and efforts in the parish attracted the attentions of Ignatius Bourget (1799-1885), Bishop of Montréal. In 1843 Bourget asked Eulalie and Mélodie to travel to a small school in the village of Longueuil, just across the St. Lawrence River from the island of Montreal, to found a new religious teaching community. Arriving on Oct. 28, 1843, they were greeted by Henriette Céré (1804-1885), who already lived and taught at the little school. Formal education for young women and girls, especially among the less fortunate, was rare in Canada in the early 19th century. The new Congregation’s first focus was solely on educating young girls. For inspiration, Eulalie, Mélodie and Henriette looked to an order of Sisters in Marseilles, France. Because the French Sisters could not spare anyone to come to Canada to train the novices, the three women crafted a Canadian version of the order and named it the Sisters of the Holy Names of Jesus and Mary. On Feb. 28, 1844, Eulalie received the religious name Marie Rose; Mélodie became known as Marie Agnes; and Henriette became Marie Madeleine. During the 1843-1844 school year, the three postulants divided their time between their religious and educational studies and their students. In 1844, they purchased a new property to accommodate a growing number of students as well as candidates for their community. In August 1844 Sister Marie Rose led a procession of Sisters, students, and friends from the Foundation House to the much larger convent and boarding school nearby. Among those in the procession were women destined to carry the Holy Names’ work thousands of miles from Quebec, including Sister Theresa of Jesus (Salome Martin, 1823-1890) and Sister Veronica of the Crucifix (Hedwidge Davignon, 1820-1903). Sisters Marie Rose, Marie Agnes and Marie Madeleine made their religious profession in December 1844. Bishop Bourget named Sister Marie Rose the first superior of the Congregation. Under her leadership, many new candidates joined; their school grew; and Sisters were sent to open new foundations elsewhere in Quebec. Unfortunately, Mother Marie Rose’s frail health declined and she died on her 38th birthday, Oct. 6, 1849. In spite of internal and external challenges, the order that she founded continued to grow. Sister Veronica of the Crucifix was named Superior General in 1849; Sister Theresa of Jesus succeeded her in 1857. The two could not have been more different. Mother Veronica was content to grow the Congregation in Quebec, focusing on the development of a strong educational curriculum. Mother Theresa, on the other hand, was brimming with missionary zeal. When a request for Sisters came from distant Oregon, on the Pacific coast, it was Mother Theresa who took up the challenge, agreeing to send 12 Sisters. The Oregon foundation was only the first of many to be opened by the Sisters throughout the United States and Canada by the end of the 19th century. In 1844, Bishop Bourget had offered this advice to the Sisters: “In union will be your strength. May it be the soul of your little community.” It was advice the Congregation took to heart. No matter the distances traveled, no matter the years that pass, the Sisters of the Holy Names have stayed united and true to the ideals and teachings of Mother Marie Rose. By the time of her death in 1849, the Congregation had four houses and 44 religious (including seven novices and seven candidates). By the opening of Vatican II in 1962, 4,000 Sisters residing in 277 houses were teaching more than 100,000 students in Canada, the United States, Lesotho, Peru and Brazil. Over the years, the Sisters of the Holy Names of Jesus and Mary have given more than 6,500 religious to the world and the Church. Today, the Congregation’s mission continues in Canada, the United States, Lesotho, Brazil and Peru. On Oct. 2, 1972 the cause for Marie Rose Durocher’s beatification was officially introduced by Pope Paul VI. On July 13, 1979 she was declared “Venerable,” and on May 23, 1982 she was beatified by decree of Pope John Paul II made before a crowd in St Peter’s Square in Rome. 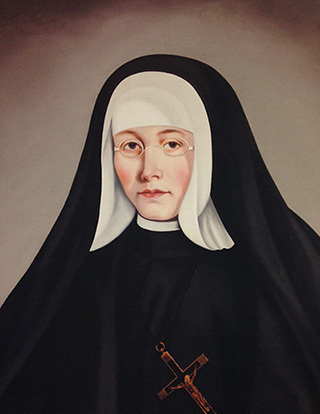 She is known now as Blessed Marie Rose Durocher, and her feast day is Oct. 6.